How does one do scholarship in dialogue with the dead? After reading Chris Moffat’s essay, “Politics and the Work of the Dead in Modern India,” we thought he might have good answers to that question. So we asked him. Read on for his intriguing response. CSSH: In your essay about Bhagat Singh (1907-1931), the famous Indian revolutionary who was executed by British colonial authorities, you argue that today he is not merely a symbol of anti-colonial resistance, or a political exemplar whose memory can be put to use by living people. Instead, you give this dead hero much greater power. You suggest that Singh impinges on, or shapes, or inspires the actions of the living. That he “haunts” them. Not exactly as a ghost would, but as a kind of prompt that incites Indians to take on the unfinished business of contemporary politics. He subsists (in strange ways) on the agency of the living. This is the “afterlife” of Singh, the martyr. You develop this argument by interpreting Singh’s presence among Hindu nationalists, Maoist student activists, and Sikh separatists. What we’re curious about now, however, is how Singh exerted his peculiar influence on you, on your essay and the research you did. At some point, it seems that Singh began to haunt you, and that his afterlife is tugging at your own scholarship, participating in it. It also seems that this relationship would be for you, a scholar who is not Indian, quite different from Singh’s influence on the people you write about in the essay. We don’t expect you to tell us ghost stories — although we’d listen closely if you did! — but could you give us a practical sense of how Singh, as an agent who is personal and vital but no longer living, interacts with your work? Not how he figures in your work. That we can see and understand from your paper itself. We’d like to know whether, and in what sense, Singh is active in your work. And if this is not haunting, or a ghostly presence, what is it? Perhaps we really do want you to tell us a ghost story. Chris Moffat: Thank you for this generative prompt, which I will approach with an anecdote. My fieldwork in Indian Punjab took me to Khatkar Kalan, Bhagat Singh’s ancestral village in Jalandhar District and the site of a small museum devoted to the revolutionary. My time there coincided with an annual mela (festival) to mark Bhagat Singh’s death anniversary, 23 March, and on this day I had a conversation with a journalist who was interested in why I, a white Canadian with no familial connections to India, had been drawn to convene with this history. At one point he asked me how Canada had “achieved independence”; I chuckled, told him that the Queen of England remains our head of state, and that sovereignty had been secured by the peaceful deliberations and dry constitutional maneuvers of an elite caste of public men over many decades. I had not realised our conversation was in fact an ‘interview’, and was surprised to find my comments in the Punjab edition of a national newspaper the next morning, rendered dramatically as (and I paraphrase) “Canadian PhD student seeks inspiration from Bhagat Singh because his country has no heroes”. I read this headline with great embarrassment, not least because of my keen interest in Canadian history, its rich genealogies of working class and immigrant activism, and indeed the often-overlooked but vital traditions of indigenous politics that continue to animate the country to this day. And yet the journalist had named a problem that is also underlined in your prompt, which is this question of my compulsion toward Bhagat Singh: the power of this history and the manner in which it had pulled me to rural Punjab and to countless other locations across north India and Pakistan in search of a dead man’s spirit. It is also a question about how this search transformed me. 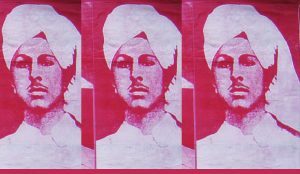 The sociologist Avery Gordon insists in her work on haunting that, “the ghost has a determinant agency on the one who searches.” 1 What did I gain and what did I lose of myself in the constant company of Bhagat Singh over almost a decade of research? If, as I write in my CSSH article, Avijit Bansal’s anxiety in the martyr’s shadow forced him to confront his own inaction, then the seriousness with which my interlocutors in India, Pakistan and elsewhere treated Bhagat Singh meant I could hardly pretend to transcend the fevered contest over his inheritance. Rather than a passive observer I felt my own political subjectivity enlivened by these high stakes. I began this research as part of a PhD project, and so Bhagat Singh would accompany me through successive moments of urgency in my life as a student in the UK: the mass demonstrations against cuts to education and the tripling of university tuition fees in late 2010; the protests against the police killing of Mark Duggan which started near where I used to live, in Tottenham, in August 2011; and the energy that attended the global spread of the Occupy Movement shortly thereafter. My interest in the revolutionary was propelled by a desire to work through questions of political commitment, the consequences of violence and the peculiar responsibility of youth to their era. Looking back, this searching is palpable in an early piece I wrote for Postcolonial Studies, entitled ‘Experiments in Political Truth’ (2013). There I sought to articulate with Bhagat Singh a nomadic sense of responsibility to a shifting and contingent present – an attempt to understand why radical actors might be powerful in a historical moment other than their own. Such a dialogue with Bhagat Singh belongs to a melancholic, twenty-first century political moment where, according to the late cultural critic Mark Fisher, “the ghosts are swarming”. The question of how the living might grapple with the force of the spectral – the power of the no longer (but still effective) and the not yet (but already effective) – remains an open one. 3 In the UK, one reactionary response is captured in an image from the aforementioned student demonstrations: a protestor with the ‘Book Bloc’ (who carry riot shields designed to look like book covers, in this case a Derrida text) clashes with a police officer, so that the cop’s baton is raised to literally beat back Specters of Marx. In India, too, there are regular attempts to banish the troublesome dead – to silence the past, exorcising spirits or providing them a stable tomb. But this context also proved instructive for thinking about how new political projects might engage a condition of unfinished business – creatively negotiating the demands of inheritance in activism, the arts, pedagogy and commemorative ritual. Amidst the lively debates characterizing history’s public life in India, I was drawn to the peculiar possibilities associated with presence: the way the dead could orientate the living to the future. The earliest draft of my CSSH essay was in fact written for a ‘Ghost Hosting’, a visual arts and research programme curated by the artist Sarah Sparkes at Central Saint Martins in 2013. Another speaker was the filmmaker Marcy Saude, who has been interested in the relationship between conjuring rituals and radical politics; in one project, she experiments with Hoodoo ‘tricks’ to aid anti-austerity struggles in the Netherlands; in another, she creates magical talismans and charms to protect protestors in Oakland from police violence. In contrast to Saude’s work, my relationship to the dead Bhagat Singh appeared categorically tame. However powerful the sense of intimacy and investment produced through the search, I found it difficult to shake that lingering pretension to scholarly remove – my claim to the dead competing with a disavowal. This has been a stubborn habit to break. I operate in a discipline – history – that relies on severing the past from the present, thus establishing the former as worthy of record. My attachment to Bhagat Singh is displaced in writing by academic deferrals, the mediation of citations, of other people’s ghost stories. And yet this does not mean he is not active: my choice is not simply between scholarly dispassion and ghostly possession. In Specters of Marx – the book, not the riot shield – Derrida argues that there can never be a singular relationship to the dead; there will always be a multiplicity of inheritors. But within the heterogeneity of an inheritance, the living can choose to affirm its radical, “most living part”; they can resist the desire for exorcism or entombment, embracing instead the call to escalation, the vertiginous urge to address unfinished business. This, then, is how I choose to labour under the gaze of Bhagat Singh: in affirmation of that restless, questioning urge, the promise of a dissensual movement, and foregrounding in my historical and pedagogical practice the political and intellectual possibilities that can be seized from the past, for the present, in dialogue with the dead. Chris Moffat is a British Academy Postdoctoral Fellow in the School of History, Queen Mary University of London. Avery Gordon, Ghostly Matters, p.98. For the British context see Mark Fisher, Ghosts of My Life (London, 2014).